UAO aims to serve as the African Community Resource Clearinghouse wherein constituents gather, access information, share experiences, exchange views, and coordinate organizational capacity development. UAO's hub of resources on this website is intended to assist community members in navigating services, programs and resources that are available to help them cope better in the United States. The Immigrant Youth Justice League will be hosting a rally on Sunday, March 10, 2013 the Federal Plaza in Chicago. National Coming Out of the Shadows started in Chicago, Illinois on March 10th, 2010 when undocumented youth declared to be “undocumented and unafraid” at Federal Plaza, facing the immigration and federal office building. Around the country, other undocumented youth did the same, some times escalating to civil disobedience in support of immigrant rights. This year, IYJL continues this work, this time focusing on those being criminalized by the federal government and immigration enforcement: people in deportation proceedings, people in detention, those who do not qualify for deferred action, and those with past interactions with the law. For more information about Immigrant Youth Justice League, or National Coming Out of the Shadows, visit their website by clicking here! What Can Medicaid do for YOU? The Illinois Senate approved Medicaid Expansion last week. As part of the Affordable Care Act, States have the option to expand Medicaid coverage for individuals that are currently ineligible. Under current Medicaid requirements, adults who do not meet a specific categorical requirement (such as being older than age 65, have certain disabilities or is a parent of a child under 18) have never been eligible for any public health care coverage under Medicaid, even if they are very low income. For Illinois, this means approximately 600,000 people would be eligible starting in 2014 because they are below 138% of the Federal Poverty Limit. You or someone you know might qualify. Below are key components and expected benefits of Medicaid Expansion in Illinois. All adults with incomes at or below 138 percent of the Federal Poverty Limit ($15,415 for an individual) will be able to enroll in Medicaid starting January 1, 2014. Currently, adults are eligible for Medicaid only if they have disabilities or care for dependent children. The federal government will reimburse Illinois for 100 percent of the costs of covering these newly eligible enrollees through 2017. The reimbursement rate will decrease gradually after 2017 but stay at 90 percent after 2020. If the federal government fails to reimburse the state at 90 percent or above, the newly eligible clients will become ineligible; Illinois will not be stuck with the bill. State Senator Van Pelt on the Illinois Senate vote to expand Medicaid, last modified February 23, 2013, http://senatorvanpelt.com/index.php/news/81-state-senator-van-pelt-on-the-illinois-senate-vote-to-expand-medicaid. UAO and Allies Rally in Springfield! On February 27, 2013, UAO Executive Staff and allies lobbied Illinois legislators in Springfield to ensure that immigrant services such as Citizenship workshops and healthcare awareness are still funded in the next fiscal year. If you want to get involved with our efforts, contact your representatives today to insure immigrant services are still funded in Illinois by visiting Who Is My Representative, today! The Empowerment Fair 2013: “Road to Financial Freedom” presented by Delta Sigma Theta features workshops on saving money, debt reduction, estate planning. This event also gives you the opportunity to open a savings account by a local bank! Get started on your road to financial freedom! Be sure to also stick around for their Job and Career Fair from 1:00-4:00pm! The Job and Career Fair will include workshops on interviewing skills, resume writing, and career building! Get Advise from experts on job searching and the power of social media for job searching! Be sure to bring your resume for review! Umu Igbo Alliance presents: Chat, Choose, Date. C.C.D offers a unique approach to the usual “Meet and Greet” with the purpose of encouraging people to meet, mingle, and share while forming new connections . Think of this as an amped up version of your typical happy hour or get together. C.C.D offers an interactive, safe, no pressure way to network, make new friends, meet your match… or just have a great time. The format offers ice breakers/speed mingling/ date auction/bowling and many more. Come for the fun; stay for the laughter, great conversation, new faces and intriguing discussions! Dating vs FWB (Friends with benefits)…Is there really a difference? Secrets vs Tell all (Do you want to know everything about his/her past, including with who/where/when…if so Why? How best should one define “submission” keeping in mind of one’s African upbringing intersected with one’s American assimilation? Social Media dating etiquette…is there such a thing? How does that translate culturally with an African background/tradtition? Are you interested in being a bachelor or bachelorette in our charity SILENT Dating Auction (a fresh twist on the usual dating auction). Here is your chance to win a free bowling date, meet new people all while giving back to the community and helping out a good cause. FREE Reading Classes at JARC! 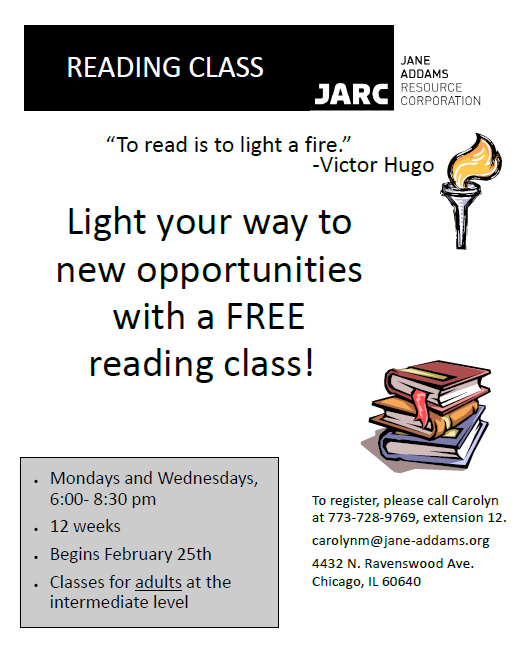 The Jane Addams Resource Corporation (JARC) will be offering a 12 week reading course every Monday and Wednesday starting Monday, February 25th! These classes are for adult readers at the intermediate level (4th-8th grade) and is designed specifically to help participants hone word recognition and pronunciation skills, read more fluidly, develop an academic vocabulary, and apply reading comprehension strategies to a variety of texts. or via email: carolynm@jane-addams.org, today! Are you interested in immigration policy? Join us at the Immigrant Integration Policy Summit hosted by the Illinois Coalition for Immigrant and Refugee Rights (ICIRR)! The summit will also include workshops and trainings on deferred action for childhood arrivals (DACA), immigrant rights, higher education, parental engagement in early childhood education, health care access and other important facets of immigrant integration. 12:00pm-1:00pm: Closing Session with members, allies and elected officials. This workshop will be held in the Cafeteria, floor 2. You and your family can apply to become U.S. citizens! If you have been a Legal Permanent Resident (Green card Holder) for at least 5 years, (or) 3 years and you are married to a U.S. Citizen, then you are eligible to apply to become a U.S. Citizen. Date of prior marriage, date the marriage ended and reason the marriage ended. Your income is equal to or less than that listed in the table. Letter from the Department of Human Services (DHS) stating the date when you started receiving Food Stamps (LINK card), Medical and TANF benefits. DACAmented Youth & Allies: Take Action! Do you want to learn about next steps after you’ve been “DACAmented”? Do you want to join the fight for Comprehensive Immigration Reform from your school, college, or community? Deferred Action youth and allies will learn ways and strategies to get involved in local campaigns like the fight for youth employment in IL and the national fight for immigration reform! Meet dozens of other youth and allies who will fight for the rights of our community in 2013! Youth from Albany Park Neighborhood Council and ICIRR youth leaders will lead conversations on concrete steps we can take to win victories for our communities! Do you know your rights with the police and with immigration? Do you know what the family unity waiver is, and if your family qualifies? Do you know what you need to do NOW in order to apply for your Temporary Visitors Drivers License in November? Come to this workshop to find out the answers to these questions and more. This workshop will provide important information to help KEEP FAMILIES TOGETHER. *Immigration attorneys will be present to help answer questions, but individual legal consultation will NOT be provided in this session. ¿Conoce usted sus derechos, con la policía y con inmigración? ¿Sabe lo que es el perdón para la unidad familiar, y si su familia califica? ¿Sabe los pasos que tiene que tomar AHORA para solicitar su licencia de conducir (TVDL por sus siglas en ingles) en NOVIEMBRE? Venga a este taller para conocer las respuestas a estas preguntas y más. Este taller proporcionará información importante para ayudar a mantener la familia unida. * Abogados de inmigración estarán disponibles para ayudar a responder preguntas, pero consultas legales individuales NO serán proporcionadas en este taller. Understanding existing health care services and upcoming changes helps maintain healthy communities and healthy families. The new health care law, the Affordable Care Act (ACA), will have profound effects on how immigrant families access health care. The ACA is designed to protect consumers and lower the cost of insurance and out-of-pocket medical expenses so that more people can have access to insurance. Some immigrants will benefit significantly while others will be largely left out of coverage. This workshop will provide an overview of ACA and what should be expected in 2014. How will seniors be impacted? What other healthcare resources are currently available to our communities? What is County Care and how does it benefit those living in Cook County? The Parent Mentor Program is engaging immigrant parents and families as leaders in 55 schools around the State of Illinois. This workshop will provide participants with more information about Parent Mentor Program basics, the history and philosophy of the program, and testimonies from current Parent Mentors. This group will join with the Existing Parent Mentor Partner Session for the second half of the training. This workshop is geared towards those not currently involved in the Parent Mentor Program who would like to learn what all the buzz is about! The Parent Mentor Program expanded to a total of 13 ICIRR member organizations this Spring. This workshop is designed as a reflection and strategy session for partners and key stakeholders already involved in the Parent Mentor Program. This group will join with the Parent Mentor 101 group for the second half of the training. Hear from experts in education about Opening Doors for DREAMers, the High School to College Pathway, and the Adult Education (ESL & GED) to College/Career pathway. Today’s Illinois cities are at the hub of an increasingly growing immigrant population that makes up 13.5% of our state’s population. As the level of government closest to the people, municipalities are well positioned to respond to our communities’ needs. Around the country, cities in partnership with local community organizations are developing policies and practices that accelerate the settlement and integration of immigrants, and engage local residents in building safe, healthy and prosperous communities. In this workshop we will discuss immigrant integration with a focus on the municipal level, share best practices for creating more welcoming cities in Illinois and throughout the country and engage key stakeholders to build momentum for expanding welcoming cities throughout Illinois. Join us for a panel discussion on effective coalition-building that responds to the criminalizaton of the immigrant and African American communities. The Corrections Corporation of America, which runs for-profit jails and detention centers across the country that incarcerate and detain many immigrants and African Americans, is trying to come to Illinois. CCA failed to build a detention center in Crete, IL due to community mobilization and effective advocacy efforts, but they now plan to build in Joliet, IL instead. How do we forge effective coalitions to respond to problems that affect all of our communities? The Presidential Election may be behind us, but municipal elections are quickly approaching! The immigrant vote continues to show its strength in local and national politics, but how do you know that every voter’s rights is being observed on Election Day? Get to know the common issues facing voters at the polls from voter intimidation to language access. Also learn how communities can use local voting power to keep inhumane immigration practices like detention facilities out of our communities! Attendees will get trained in poll monitoring so you can ensure that our community’s voice is heard. Immigrant women may face a difficult time escaping abuse due to their immigration status. They often feel trapped in abusive relationships because of immigration laws, language barriers, social isolation, and lack of financial resources. We will address barriers to services such as cultural, language, legal, economic and the fear of deportation. In this workshop, we will discuss the dynamics of domestic violence and mental health in immigrant communities. Participate in the Housing Resources Workshop provided by Northside Community Resources and the Rogers Park Community Development Corporation! This workshop will provide attendees with information and resources on Rental Housing, Foreclosure Prevention, and Homebuyer Assistance. Participe el taller de Recursos de Vivienda de Northside Community Resource y el Rogers Park Community Development Corporation! Este taller ofrecerá a los asistentes con información y recursos sobre Viviendas de Alquiler, Prevención de Embargos Hipotecarios y Asistencia para Compradores de Vivienda. Join Rudy Lopez and Gabe Gonzalez to learn about effective state and federal advocacy. 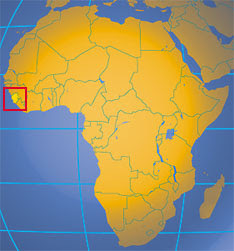 Study Abroad Opportunity in Sierra Leone! If you are interested in postwar reconstruction and nation building in Africa, then Northern Illinois University (NIU) has the perfect study abroad opportunity for you! 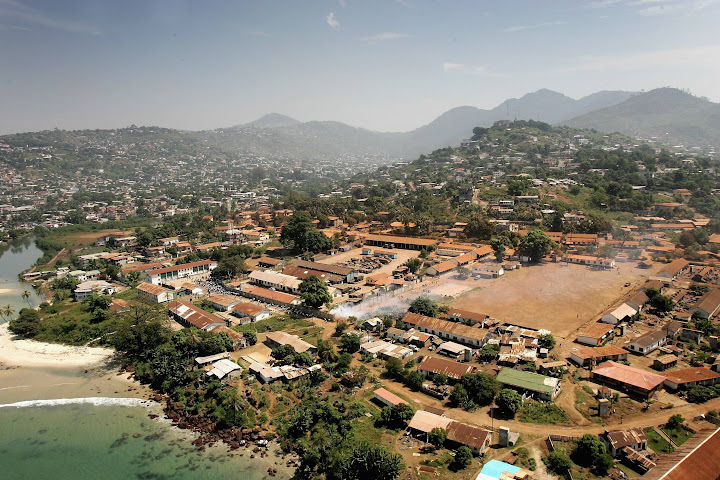 The theme this year is “African Democracy and Socio-Economic Development through Sustainable Engineering”, where students will have the opportunity to broaden their horizons on cultural diversity and global interconnectedness by traveling to Sierra Leone! In partnership with the University of Sierra Leone, this program will be held from June 15, 2013-June 30, 2013. Students can pay for the program with financial aid. Graduate students can take up to 6 credits and undergraduates can take up to 9 credits. The program is open to any college student in the US. Students can use the independent studies to tailor a qualitative method course or any other course that is relevant to their discipline (political science, sociology, anthropology, history, etc.). The admission is first-come-first-serve with only 14 slots. The last day to register is March 1, 2013; reserve your spot, now! For more information, visit the African Democracy and Socio-Economic Development through Sustainable Engineering fact sheet by clicking here. Broaden your horizons and start your path in becoming a global citizen!